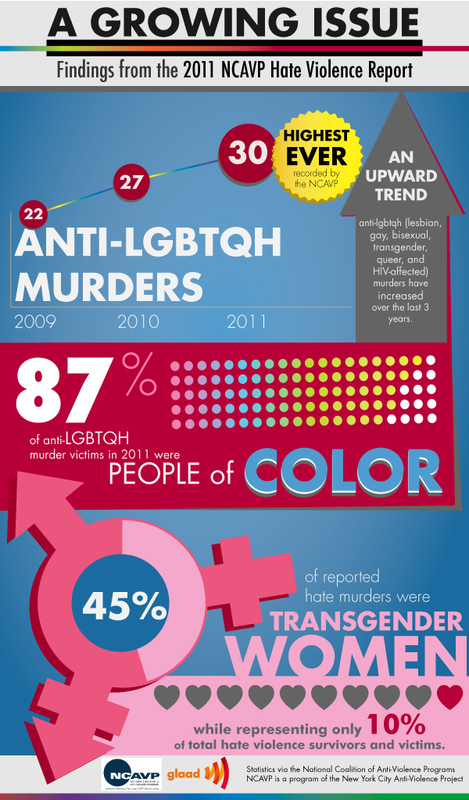 The murder rate of people who are lesbian, gay, bisexual, transgender, queer, and HIV-affected (LGBTQH) is at its highest, according to a recently released 2011 report from the National Coalition of Anti-Violence Programs (NCAVP). The report also shows that transgender women, people of color, and youth and young adults are at a disproportionately high risk of being victims of what the NCAVP terms hate violence. NCAVP gathered data from anti-violence programs in 16 states and found that, while hate violence incidents have decreased, the overall number of hate murders of members of the LGBTQH community has increased by 11%. Of those murdered, 87% were people of color, showing an increase from 70% in 2010. Furthermore, people who identify as transgender were 28% more likely to experience physical violence than those who are gender normative, according to the media release about the report. The New York Times’ dehumanizing coverage this past month on the suspicious fire that took the life of Lorena Escalera, a transgender woman of color, is particularly pertinent in light of NCAVP’s findings. Violence against the LGBTQH community, especially its members of color and trans members, is a growing and tragic epidemic. GLAAD encourages the media to continue to shine visibility on the violence such people continue to face and honor the humanity of the victims.